Originally published in 2003 then reprinted with a spiffy new cover in 2008, Robin McKinley’s Sunshine is a modern-day take on the Beauty and The Beast fairytale. Or perhaps it would be more accurate to say that Sunshine is a modern-day Beauty and The Vampire fairytale. Set in a modern-day world that is populated with demons, weres, vampires and magically inclined humans Sunshine sounds like any one of a dozen similar urban fantasy novels but Sunshine really isn’t an urban fantasy story. Sunshine’s world has something of a post-apocalyptic feel. The story is set in the years after the Voodoo Wars where humans and Others battled fiercely for supremacy and while the humans won the war the population was decimated and large parts of the world became uninhabitable. Worse, there is the feeling that the Dark Others, namely the vampires, cannot be stopped and will eventually takeover the planet. Sunshine is the story of Rae (Sunshine) Seddon who works as a coffeehouse cook - feeding the population of New Arcadia muffins, cinnamon rolls and other sugar laden treats, while indulging a secret passion for lurid novels about the Dark Other races. Her world gets turned upside down when dire circumstance forces her to ally herself with Constantine, a vampire (and mankind’s worst enemy) in order to save both their lives. This happens near the start of the book - the consequences of her actions are what make up the rest of the story. 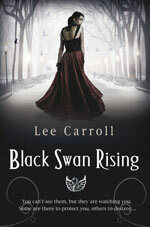 By now (in a post Twilight world) fantasy readers are used to the idea that vampires are not necessarily evil monsters and that they can even make the grade as romantic hero material. In Twilight, it’s no hardship for Bella to fall in love with Edward. Handsome, intelligent, rich, immortal, cool vampire mind-reading powers, a great family and a “vegetarian” to boot – she would have to be mad not to want him! Sunshine follows a more difficult path in her relationship with Constantine because he is everything no sane person would want to have anything to do with. The vampires in Sunshine are not romance heroes. They are evil, unattractive and disturbingly wrong. There very alien-ness is repulsive to human sensibilities and it is this which makes Sunshine such an unlikely romance story because while Constantine may appear to be less evil than other vampires there are still a lot of grey areas in his moral landscape that the author never explores. Readers who dislike ambiguity in their characters and like to have every loose end wrapped up may find Sunshine a challenging read because the author leaves a lot to the readers own imagination and trusts them to make up their own minds. Sunshine is narrated in first person by Sunshine herself. Usually this style of narration lends itself to fast-paced storytelling but Sunshine is no usual book and the first-person narration here is full of introspective monologues that meander between sections of dialogue. Even during the story’s thrilling climax, Sunshine manages to find the time for lengthy analysis of what she sees, hears, imagines and above all feels. This style of storytelling is probably the thing most likely to switch readers off this novel and I think it is what makes Sunshine a book that readers will either love or will be unable to work out what all the fuss is about. As someone who likes ambiguity in their characters, who likes to make up their own mind, and has loved the story of Beauty and The Beast since childhood Sunshine is one of my favourite novels. It is the ultimate in comfort reading on the days when I am convinced that the world hates me. It inspires me to get out my own baking trays and make muffins, iced buns and other comfort foods to feed my family and friends. Readers looking for a grown-up book to fill the gap left by Twilight could find that Sunshine perfectly fits the bill. 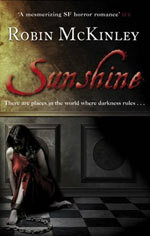 You can read an excerpt from Sunshine and find out more about the other works of Robin McKinley at the author’s site. Visit Robin’s website.